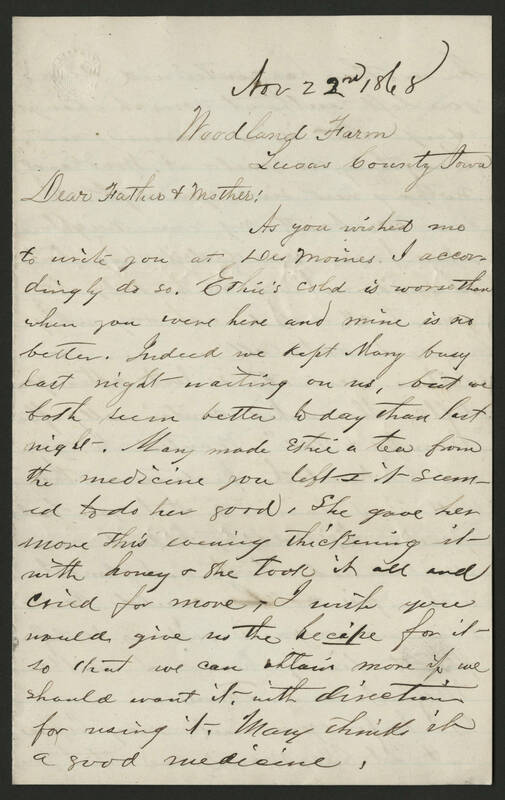 Nov 22nd, 1868 Woodland Farm Lucas County Iowa Dear Father & Mother, As you wished me to write you at Des Moines I accordingly do so. Ethie's cold is worse than when you were here and mine is no better. Indeed we kept Mary busy last night waiting on us, but we both seem better today than last night. Mary made Ethie a tea from the medicine you left & it seemed to do her good. She gave her more this evening thickening it with honey & she took it all and cried for more. I wish you would give the recipe for it so that we can obtain more if we should want it with direction for using it. Mary thinks it's a good medicine.